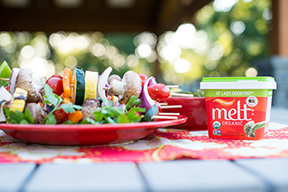 Whether you’re looking for a buttery spread to whip up your favorite chocolate frosting recipe or your mouth is watering for something to butter up the grilled corn on the cob during your July 4th celebration, MELT Organic has you covered. MELT Organic offers products that are both delicious and affordable, but it’s also a brand name that you can feel great about supporting. Most of their products are vegan, including the new MELT Organic Probiotic Buttery Spread. If you’re like me, you’re always trying to find new ways to consume probiotic-rich foods. Receiving the great benefits of probiotics from indulging in a buttery spread is basically unheard of! Plus, the probiotic-rich buttery spread also contains good fats such as virgin coconut and flaxseed oils. Rich & Creamy MELT Organic is vegan, Non-GMO Project Verified, Kosher Pareve, and made from Rainforest Alliance Certified palm fruit oil. Have a gluten or soy allergy? No problem. MELT is perfect for you, or anyone else who is looking for a delicious plant-based buttery spread. MELT Organic even offers buttery sticks which is perfect for baking or smothering on bread. According to MELT Organic, their buttery sticks cook and taste just like real butter, but with ⅓ the saturated fat and calories. Even better, MELT products also provide nutritional benefits, and they can be found in many stores throughout the United States. Use their store locator to find a retailer near you. You can even order MELT products online so you can spend less time in the store and more time enjoying the summer weather. With delicious products on the market like MELT Organic, it’s getting easier and easier to go vegan each year. Bring any of these three MELT products to your 4th of July celebration and let others see for themselves just how delicious plant-based buttery spreads and sticks can really be.